Over seven months have transpired since Tacoma implemented paid parking in downtown. Like most cities, Tacoma has vastly different demand for parking depending on the area downtown. Private lot owners in Tacoma understand this concept well and adjust their prices to parking demand by logically varying the price changed for parking in different areas of downtown. However, the City of Tacoma has failed completely in this regard and still doggedly charges the same price for parking regardless of demand in various areas of downtown. The Tacoma Parking Advisory Task Force regularly hears testimony from people on the south end of downtown about the high demand for parking that exists and in other areas where is greatly reduced demand. Both are being truthful and would greatly benefit from the City carrying through on it's original ordinance to set prices based on vacancy rates of 85 percent. 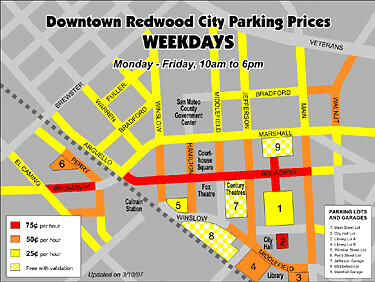 On Saturdays, most of downtown has such low demand parking should be free. One of the few exceptions are a few blocks of Pacific Avenue which have significant demand. The city's refusal to vary the prices appropriately is causing harm to low demand areas by needlessly driving potential customers out of downtown where there is ample parking available. On Saturdays, huge swaths of downtown are completely empty. So what's the right price for curbside parking? According to UCLA professor Donald Shoup, author of The High Cost of Free Parking, "the right price is the lowest price you can charge and still have one or two spaces available on each block." Depending on the demand for parking at a given location, the right price could be higher or lower than the static prices you see at traditional meters. You need a dynamic system that adjusts the price based on demand. Tacoma does not need to vary the price of parking in area of downtown Tacoma every day like San Francisco does. However, modifying it once once a month or even once a quarter would certainly be beneficial. Yes, it is a little more work, but it would be greatly beneficial to anyone contemplating starting a new business downtown or visiting downtown. Overcharging for parking in low demand areas where there is excessive vacancies does nothing more than drive people out of downtown. Can Tacoma Implement Market Rate Parking Right? by KevinFreitas on 5/4/2011 @ 7:06am Whatever they do the parking rates are going to have be the same city-wide unless they introduce some kind of confusing zone system. As it stands now one parking sticker is good where ever paid parking is required downtown. If you have $.25/hour in one place and $.75/hour in another you can bet plenty of parking thrift shopping and car moving will occur. And sites like this one will surely be full of cheap parking watchers letting folks know where they can get the cheapest parking sticker in town before they actually park. I'd rather them spend another $50k on defending Tacoma against Clear Channel and digital billboards rather than on another parking-related re-education campaign. by fredo on 5/4/2011 @ 8:04am We'll never know what the demand for paid parking is until we're willing to address the problem of all the vehicles with phony handicapped placards. These people park all day for nothing and, in many cases, are not even deserving of the privilege. They either borrow the placards from other family members, or just have phony ones created. Trying to make an informed decision about DT parking without addressing the phony handicappeds is a little like a doctor trying to diagnose a patient without the use of a thermometer or a stethascope. I'm going DT this morning and intend to park near 11th and Broadway. I'll walk both sides of the street for two blocks and report back on how many handicappeds I observe. Stay tuned. by Crenshaw Sepulveda on 5/4/2011 @ 9:17am The parking enforcement people will ask to see a driver's actual permit for the parking placard if they see the person exiting or entering the parked vehicle. If they do not have the actual permit they will be cited for illegal parking. This depends on the parking enforcement seeing the driver but I think that the city is making an attempt to stop this kind of abuse. I surveyed all the parked spaces on Broadway between S. 11th and S. 13th. There are 37 regular parking spaces and 1 handicapped designated space. I didn't investigate if the stickered cars had current stickers or not so the compliance rate may be somewhat lower. by Erik on 5/4/2011 @ 11:03am The city's refusal to modify rates based on demand is similar to a doctor who insists on giving every patient in his or her care the same dose of medicine regardless of the weight of the patient because it is "too much trouble" to vary the dose for different patients. A fine strategy if you are the average patient. For larger patients, however, they will likely not get enough of the medicine for it to be effective. For smaller patients, children, and infants the dose given will be excessive and even toxic. by fredo on 5/4/2011 @ 11:10am That's a good analogy erik, but what about this problem? Do people prefer a predictable parking fee or do they prefer an unpredictable fee? What if the Doctor had various office call fees depending on when you showed up? If a person comes in to see the doctor for a check up at 9AM he gets the checkup for $50, if he comes in at 1PM then the check up is $200. When you go to McDonalds for a $1 value meal would you be unpleasantly surprised, perhaps never to return, if every one of those items was suddenly $5 at the time you happened to arrive? Isn't there something good about consistancy? by fredo on 5/4/2011 @ 11:53am Erik, I thought you might be interested in something I heard about a couple of days ago. Ticketmaster is beginning to experiment with dynamic pricing on tickets to all sorts of events sporting and concerts alike. The way this works is that the price of seats is constantly reset depending on demand. If this becomes a model that the public is comfortable with it may be extended in other areas of life such as the parking that you have a high interest in. by Erik on 5/5/2011 @ 12:18am @Fredo: Interesting thoughts. Yes, one can never charge more than the market price for something or there will be no buyers. That is the whole basis for market based price parking. Woe to the business owner who tries to start a business in an area with low parking demand while the city sets the parking rates based on the high demand areas. It is really not that hard. Check this out: Riley and Company vary their monthly parking rates from $75 to $129 depending on the parking lot location as the demand is higher for the lot on Broadway than on Tacoma Ave. Yet, for the city, varying the cost for parking based on location is apparently too complicated to understand or too much trouble.